Where do Angel's find a restful 'Lookout'? From a gorgeous vista of Mt LeConte and serene setting, of course. We hope to provide a little touch of heaven here at the cabin for you, your family and guests. Imagine driving a gentle winding road up to your cabin in the trees. Your morning view is fantastic to begin the day, as is the evening vista watching the smoke roll through the mountains. The 'Lookout' is an ideal location; easily accessible to Downtown Gatlinburg but nestled in a classic mountain atmosphere. But the location is just the beginning of the many bonuses you will enjoy! This cabin is well appointed with high quality furniture and decor! The two King Suites centerpiece locally hand made beds from reclaimed barn wood that is simply awesome. Both King Suites are tastefully appointed with luxurious bedding, King pillow top mattresses guaranteeing a good nights sleep. Each of the spacious suites provides jetted bathtubs to help you relax after a fun day. Both have their own access to separate decks to take in the view and the mountain forest setting and have TV's with access to the Dish Joey Satellite system of 200 channels. The game room is ready to provide some serious down time. There is a Sony Brava 65" HD 4k TV with 200 Dish Satellite channels waiting for you to enjoy while others play games or a round of pool. The full sized couch folds out to a queen sleeper with the thicker mattress to allow Angel's Lookout to sleep up to six very comfortably and privately. There is a mini bar with sink and refrigerator so that the beverages and dips are close at hand. On the deck just outside of the game room is another gathering spot; the cedar swing and rocking chairs allow several people to congregate around and IN the hot tub as you make more mountain memories. Going back upstairs you'll note the open concept with the folks in the living area still connected with the kitchen for conversation. The living room is spacious and wonderfully decorated. We know you'll find it a place of rest and relaxation. The fifteen foot ceilings and seemingly floor-to-top windows let you sit inside while drinking your morning coffee and take in the views of the mountains. In the adjoining kitchen, you'll enjoy new granite counter tops, stainless appliances and an amazing rustic hickory dining table that looks out at the beautiful vista. If you decide to cook some memorable meals, the grocery store is just three minutes down the hill and we've done our best to anticipate your every need in the kitchen! The upper deck is just off the living room and is complete with Amish made rocking chairs as well as a covered picnic table to enjoy the almost constant mountain breeze. We've tried to provide an environment for an amazing getaway - your home away from home! The best of locations and an wonderful cabin in which to enjoy your time. You'll fall in love with this cabin and we hope to host you year after year. Come stay where the 'Angel's Lookout' into the Great Smoky Mountains. Shop till you drop! The cabin is located in the heart of the largest group of independent artisans in North America, The Arts & Crafts Community includes over 100 shops spread over an 8 mile loop. Enjoy the spectacular views of Mt. Le Conte and other peaks while watching the famous 'smoke' roll through the mountains. The scene is ever changing as you sip your morning coffee. If you're not gathering in the game room or at the table, the living room awaits. Each stuffed sitting chair has a fabulous view of the mountain and there is plenty of room in here for everyone! Large refrigerator with in-door ice and water options. Certainly a staple in any modern kitchen, and ready for your use at Angel's Lookout. Your convection taster over will handle bagels, muffins, toast or even a quick home made pizza! You're good to go! We've tried to anticipate your every need whether you're cooking in or just need to open a beverage. New granite counter tops surround stainless refrigerator, cooktop with oven, and dishwasher. Other than the floor to ceiling windows to take in the beauty of the majestic mountain view, this hand crafted rustic hickory table and chairs are a centerpiece of the main living area. Seats six. TV's in living area and each bedroom. The game room has one TV for those playing pool, but is also equipped with a new Sony Brava 65" HD 4k television. Dish Satellite's Joey Hopper system is installed throughout the house with 200 channels to choose from. It automatically records eight days of prime time TV - just in case there is bad weather. Blue Ray DVD player is in the game room, but with access to Netflix and 200 channels you may never need this - but it's there for your enjoyment. Dish Satellite provides a multitude of music channels that work independently in each bedroom and from every TV. Unlimited music enjoyment throughout the house. Relax and soak in the mountain from inside the hot tub. It is located privately on the lower deck. Beautiful cabin with nice porches and other amenities. The cabin met all of our needs. We loved the porches ( with a view of the mountains), the hot tub, the fireplaces, the game room, and the well-stocked kitchen. The place was super clean, too! Our family of four really enjoyed staying at Angel's Lookout. The view was beautiful from both porches. The weather was a bit chilly (late March) so the jacuzzi was nice after hiking at Great Smoky Mountain National Park and our visit to Anakeesta. We appreciated the fluffy white bath towels and all the kitchen items that made dinner prep much easier (olive oil, salt, pepper, ziploc bags, etc.) Thanks for making the cabin available! This place is AHmazing! This cabin is so cozy and so well kept. The owners Craig and Pam have thought of every little detail to make our stay as comfortable as home. From the minute you pull up to the cabin you can just feel it! Cabin was very well decorated and the beds were sooo comfortable. Fireplaces in both bedrooms. View of the mountains is gorgeous from both decks. Hot tub was just perfect for the cooler evenings! There was nothing in this cabin that I did not like. Wonderful vacation at a wonderful cabin. Hoping to visit this cabin again soon! I had never booked a stay on VRBO before so I was skeptical but I was beyond blown away we arrived at this cabin. The cabin was just as described and very well stocked with everything that you could possibly need for a vacation getaway. Towels, shampoo, blankets, cable tv, board games, dishes, silverware..... everything you'd find in your own home. The only reason why I rated this 4 stars is because there was a small leak in the hot tub and the jets in the main floor tub did not work. Other than that booking was easy, check in was easy, owners were more than accommodating if we needed to get in contact with them. I would highly recommend this place. Thanks for such a kind review! We are glad that you found the cabin so comfortable and well equipped to make your stay memorable. We look forward to welcoming you again when you return. As we communicated at the beginning of your stay, the prior guests had accidentally stepped on the filter housing of the hot tub and the part was unavailable until after your stay. The leaky part was replaced before the next guests arrived. We are grateful that the hot tub was still operable for you, although it had the small leak. And thanks for letting us know about the jets in the tub; we’ll take care of those so every item will be perfect for the next guests! We’re humbled by the overwhelming number of five star - excellent - reviews that our cabin has received for so many years. We’ll work hard to make sure things are absolutely perfect next time! This was my third time in the mountains and I must say this was the best. Can’t wait to return. I will be screaming about it to all of my friends. 'Angels Lookout II' is only five minutes from Downtown Gatlinburg, Rocky Top Sports Complex, and the entrance to the Smoky Mtn National Forest. 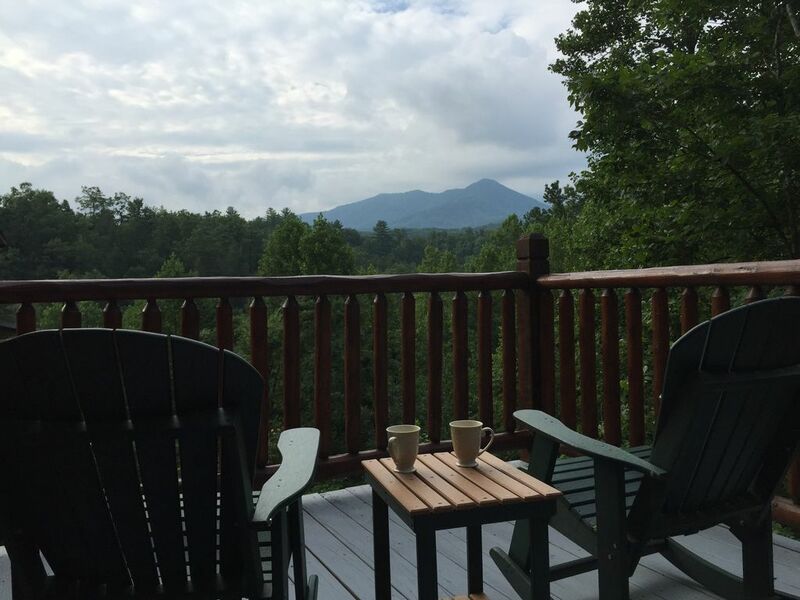 Our cabin is also centrally located to Dollywood and Splash Park, Pigeon Forge, Zip Lines, Helicopter Rides, Fly Fishing, Live Shows, Horseback Riding - not to mention 900 miles of inspiring hiking trails! The location is simply great - your view will convince you that you're looking over paradise; yet, you're only minutes from so much to do! Your Smoky mountain dream getaway awaits at Angel's Lookout II. Full refund if cancellation occurs at least thirty days prior to reserved date. 5% cancellation charge for reservations that were made by credit card.